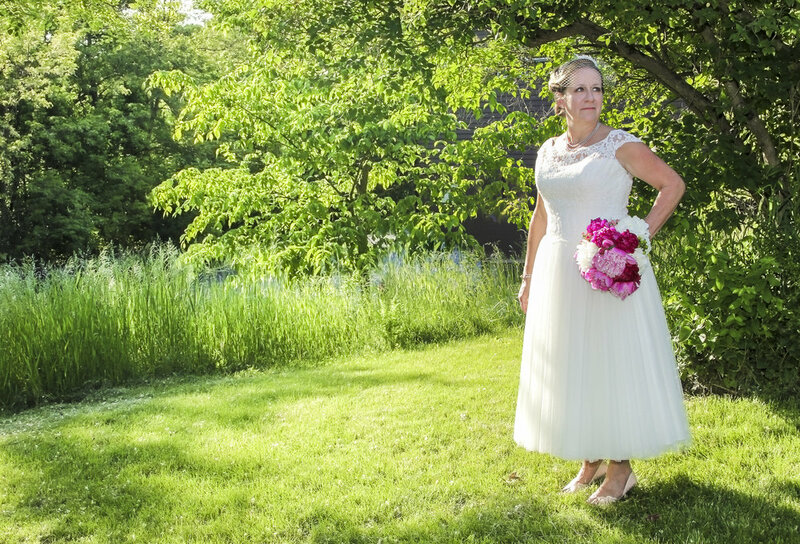 Mary wore a beautiful lace and chiffon wedding gown, straight from vintage GLAM accessorized classically with peep toe blush colored kitten heeled shoes, blush colored pedicure shining brightly and hair piece with netting. Mike was ultimately G.Q. 'd out wearing a full suit, with a long sleeve button down shirt, vest, tie and dress shoes in only one of the most humid summer afternoons in the Midwest. The chapel was filled with one of the most yummiest and sweetest smells from all the hand-cut and homegrown floral bouquets created by family and friends. Mike and Mary were friends for a long time, but as Mary's roof was in need of repair, Mike was up for the challenge and just like an angel from heaven, Mike fell through the ceiling, head over heels for Mary. These two share a deep love that I can only describe as the type of love Hollywood movies are created upon. Mike and Mary, you two are incredibly amazing people to me and sharing in part of your wedding day was such an amazing gift for me and everyone witnessing your declaration of love and devotion to each other. Mike + Mary Hoague are filled with that kind of magical love. Now that they are married, they will have each other to remind just how much magic they see in one another's love.